err this is missing some key info as to ingredient quantities? 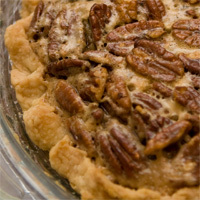 I don’t like most pecan pies except for the one we make :) The secret, you ask? Whatever the recipe says for the amount of pecans…triple it. WHAT’S NOT TO LIKE ABOUT PECAN PIE?? ?